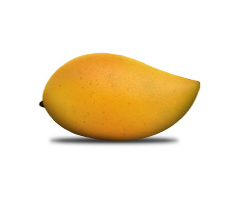 The best Totapuri Mangoes are ripened, sorted, washed, and peeled. Then they are either diced using an FAM Dicer, or if chunks are to be made they are hand-cut. The dice or chunks are dipped in chlorinated water and fed through the dewatering and infeed shaker to the IQF. The Individually Quick Frozen Dice / Chunks are then sieved, inspected and weighed. Once the packing is completed, the product passes through metal detectors and is transferred to the cold store at -18° C. The entire process is carried out under strictly hygienic conditions.